Many of the rides are climbs described in John Summerson’s book, The Complete Guide to Climbing (by Bike). When describing one of these climbs, I nclude (S-#) in the name to indicate that the ride is described in his book. The # shows the climb’s category given by Summerson (1, 2, HC=hors categorie). When I describe a climb, the distance is usually one-way, to the top. A long and rather tedious climb up Hwy 157, heading up towards Mount Charleston, just north of Las Vegas. Depending on the finish you do, the climb is either about 21 miles with 4,860 feet of climbing, or 22.2 miles with 5,500 feet of climbing. If you do both finishes, you can expect about 25.7 uphill miles with 6,440 feet of climbing. Drive north from Las Vegas up Hwy 95. Turn left on Hwy 157 following signs for Mt Charleston. Park in an obvious parking area on the right hand side of 157, a few hundred yards up from Hwy 95. For almost nine miles, climb the very straight, rather tedious and gentle climb to a big parking area and viewpoint on the right. After a very short downhill the road enters a shallow canyon and begins to curve a bit and become more interesting. Just over 17 miles and 3,900 feet of climbing from the car, after another short downhill, Hwy 158 turns right, signed to Lee Canyon. At this point you have a choice. The better finish is to turn right and follow 158 as it slashes across the hillside then does two huge switchbacks before reaching the crest of the hill after 4.8 miles and 1,580 feet of climbing. There is a large paved parking area on the left – the North Loop Trailhead. Turn around here and head back. Hwy 157 with this finish is rated HC/1 by Summerson. 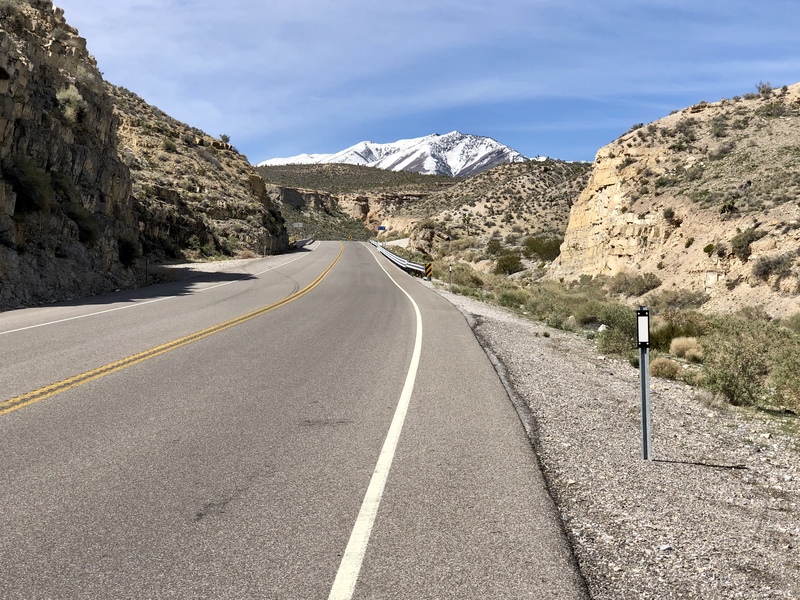 The other option is to ride up into the town of Mount Charleston and continue to the end of the road where it loops around. This is a less steep finish, and more heavily trafficked. From the intersection of 157 and 158 to the end of the loop is 3.6 miles with about 940 feet of climbing (this includes the short climb back out from the loop.) Hwy 157 with this finish is rated Category 1 by Summerson. Of course, an obvious choice is to do both finishes since you’ll probably never do the initial climb again. If you do this, I would suggest doing the 158 finish first as you are less likely to want to do this finish on the way down from the town of Mt Charleston.